Anne Wysocki, a voicer at Austin Organs, tunes a chimney flute that will be added to an organ in Cincinnati originally built by Austin in 1929. 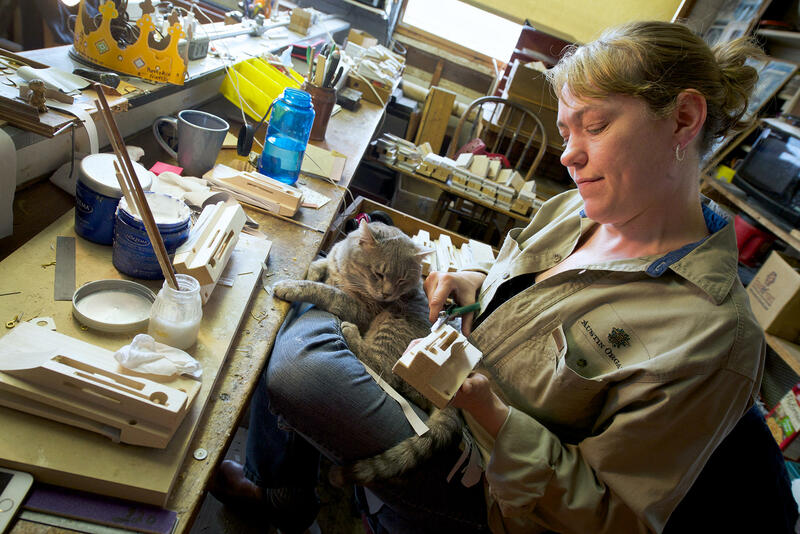 Anne Wysocki works on voicing a pipe. Handmade tools at Austin Organs are handed down from master craftsmen, some as old as 1920. Many voicers make their own tools. Henda Jackson works on making "frog" actions at Austin Organs. These parts sit under a pipe and open a valve. Tony Valdez, a pipe maker at Austin Organs, cuts out the windows for tuners in zinc pipes. John Rivera removes pipes from the drying cabinet and shapes them on a mandrel. Richard Walker sprays the back of a console toe board in a finishing room at Austin Organs. Some storage bins at Austin Organs date back to the late 1800s. A piano keyboard used at Austin Organs to voice an organ. A voicing room at Austin Organs. "When a pipe is made, it is absolutely mute. It has to be taught to speak." Fazio may say that, but he probably won’t leave the business. 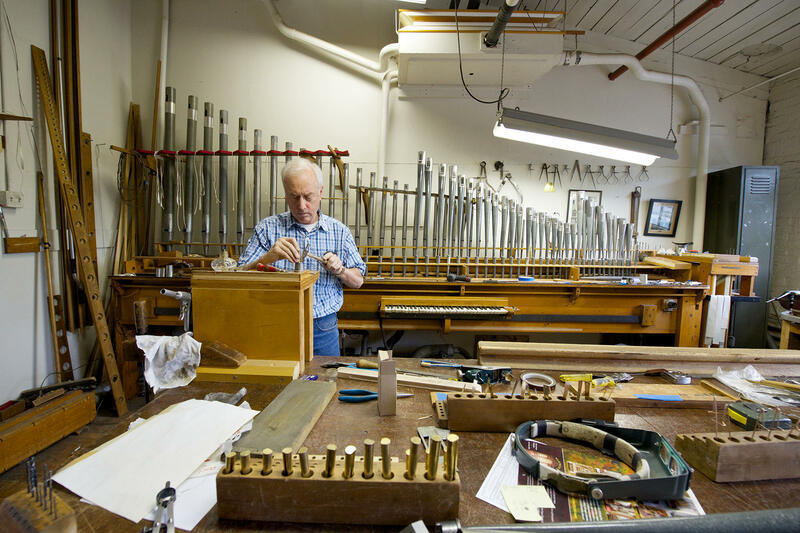 He’s been working with pipe organs for almost 30 years, and his company, Austin Organs, has been making organs for more than a century. He never stopped since he helped repair an organ when he was in college. He worked his way up, and bought Austin Organs from the owners in 2005. Michael Fazio, president and tonal director at Austin Organs in Hartford, in his voicing room. He took over the company in 2005. Made in a factory in Hartford, Austin Organs are played at the First Baptist Church in Washington, D.C., and as far away as the Forbidden City Concert Hall in Beijing. 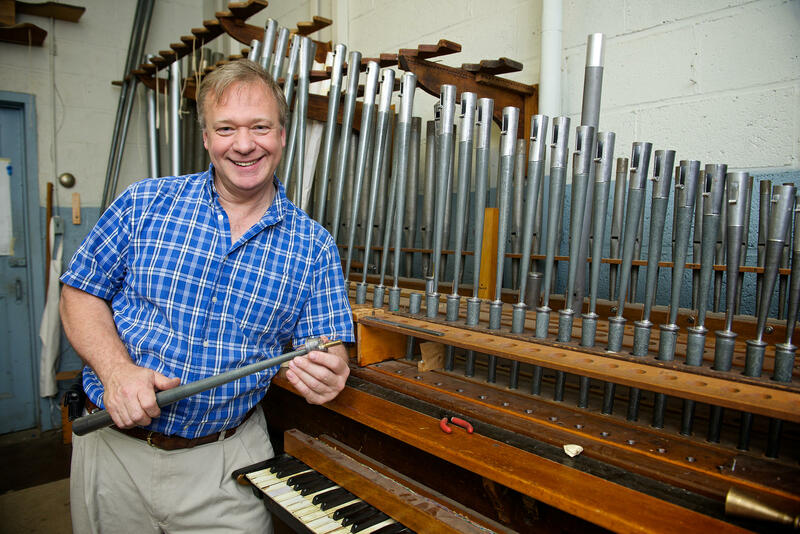 Now, among other projects, the staff are rebuilding an organ for a church in Hanover, Pennsylvania, which is also the eighth-largest organ in the world. To explain the manufacturing process, Fazio pointed to a small model of an organ, which the company sometimes displays at conventions, to explain how the organ works. It's one of the largest and most expensive musical instruments in the world. This small model is still the size of a toilet cubicle. Daniel Kingman, head flue voicer and reed voicer at Austin Organs, works to restore the French trumpet from an organ in Cincinnati. Organ insides have square pneumatics, with something that looks like a bellows. Imagine a series of wind instruments, some like flutes, and others like trumpets. Instead of having several players, one person controls all of them from a keyboard. If you take a look inside an organ, you’ll see square pneumatics, with something that looks like a bellows, with pouches made of leather. That part is controlled by an electromagnet. When the player presses a key, the pneumatics collapse, moving a tracker, which opens a valve, and sends air into a pipe. Mike Chiaradia, a chest builder, has worked for six weeks on a new wind chest being added to an organ built by Austin in 1929. To show this in action, Fazio went down to a small, dimly lit room with two rows of pipes, and a small keyboard. "Some folks in [our] factory call his my man cave," he said, in what he called a voicing room. "When a pipe is made," he said, " it is absolutely mute. It has to be taught to speak." That’s what Fazio does as a voicer. He cut a small piece of brass that's called the tongue. He made the brass tongue cover an elongated tube sticking out from the pipe, polished it, curved it at just the right angle, and wedged it into a slot with a hammer. When the keyboard sends a gust of air through the pipe, the tongue vibrates at the right frequency to get the sound you want. 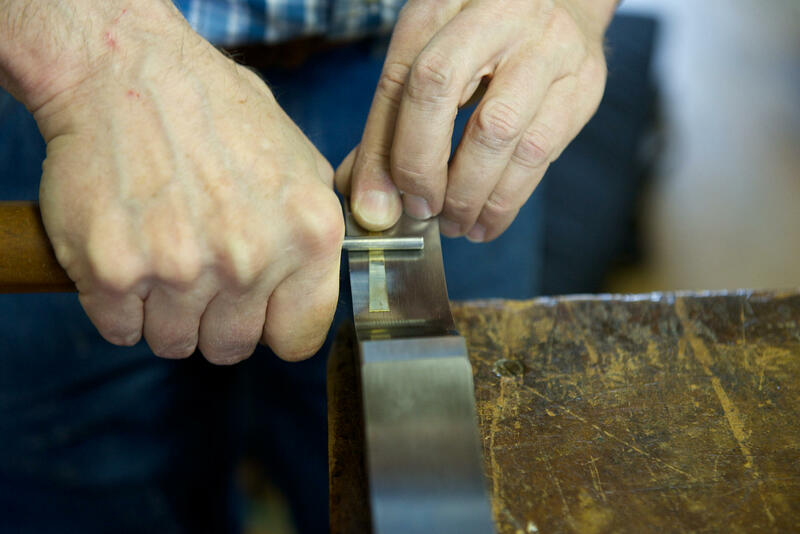 In a reed curving block, Daniel Kingman adds a curve to a brass reed tongue. When the keyboard sends a gust of air through a pipe, the tongue vibrates at the right frequency to get the sound you want. When that's done, Fazio said he tries it out to see how it sounds. He would then start a long process of refining the curve of the tongue, sometimes cutting new ones until it was right. After that, all the pipes are tested to make sure they have the right voice. Outside the voicing room is a much larger room, the height of two stories lit by rows of windows at the top, called an erecting room, where organs are assembled and tested, before they get taken apart and assembled again at the destination. The erecting room at Austin Organs, where the instruments are assembled and taken apart. One organ the company made for a church in Washington, D.C. was so large that it had to be assembled in three parts, rather than all at once. It wouldn’t even fit in the erecting room. 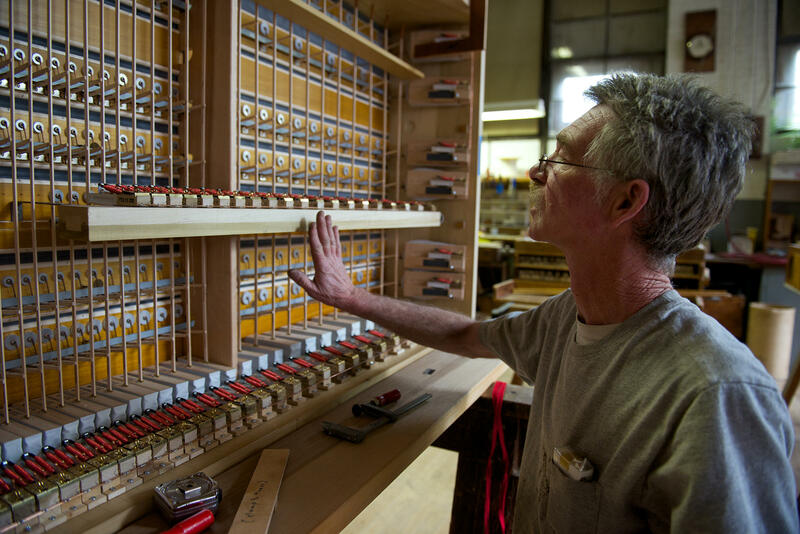 Engineering director Raymond Albright was testing all 335 knobs on the organs to make sure they worked properly. The knobs are called stops. Fazio said that’s where the term “pulling out all the stops” comes from. Raymond Albright testing knobs at Austin Organs. "You have to be a musician, an artist, an engineer, [and] an electrician." Albright has also worked in organs for 30 years. Making parts for organs isn’t easy, but Fazio said there's a lot to do, so you're never really bored. "You have to be a musician, an artist, an engineer, [and] an electrician,” Fazio said. “One thing that young folks coming into the business often say [is] that they're never bored. There's always something new to learn, something different, especially in a company as large as Austin. ...I often say that we can build just about anything, but we don't chop down trees, or slaughter sheep." You don't need to be an expert when you start. Sarah Rigby Bryan has been making parts for the company for four years now, but she came from a very different background. "I worked in the restaurant business," she said. "I worked for an insurance company, before that. " Bryan started at Austin when a friend told her about "something very good for you to do." Her friend said it's "like arts and crafts," and Bryan ended up loving it. Sarah Rigby Bryan sits with Hoppy, one of many friendly stray cats semi-adopted by workers at Austin Organs. Bryan is making pedal actions while enjoying the cat's company. When Bryan first started, she would spend an entire month or more just making one part. She admitted it became quite repetitive, but organs have lots of parts. Once she mastered one thing, she'd move onto something else. Marvin Vincent, who works with Bryan, has only been at Austin Organs for three months. Before arriving at the company to make electromagnets for organs, he helped prepare patients for surgery at a hospital. 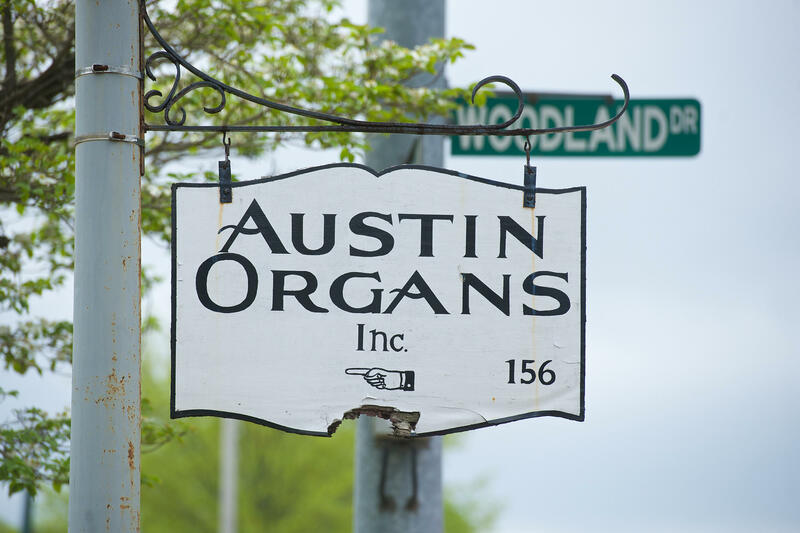 The Austin Organs sign at Woodland Street and Woodland Drive in Hartford. Pipe organs like these don't come cheap. Fazio said they range from a quarter of a million dollars to $3 million or $4 million. Electronic organs have gotten closer to replicating the sound of pipe organs without costing nearly as much, but Fazio said it's just not the same. For one thing, pipe organs sound different with time, and that's actually a good thing. "Think of…a person singing," Fazio said. "No matter if they're a professional singer, or the best singer in the world, they're not going to generate sound that's going to be uniform from one second from one day to another. We want to have variety, and the different colors, and that is the nature of the pipe organ: it constantly challenges your brain to think in new ways, and there's where the creativity happens." That creativity is still in demand. Fazio said they have enough orders to keep the company occupied for the next few years.